Last month, I found myself playing with a new Sharpie which I love love LOVE! Who would have thought that I could get so passionate about an ink pen? But there you have it. I love to draw and express whatever wants to emerge from inside me at the time. 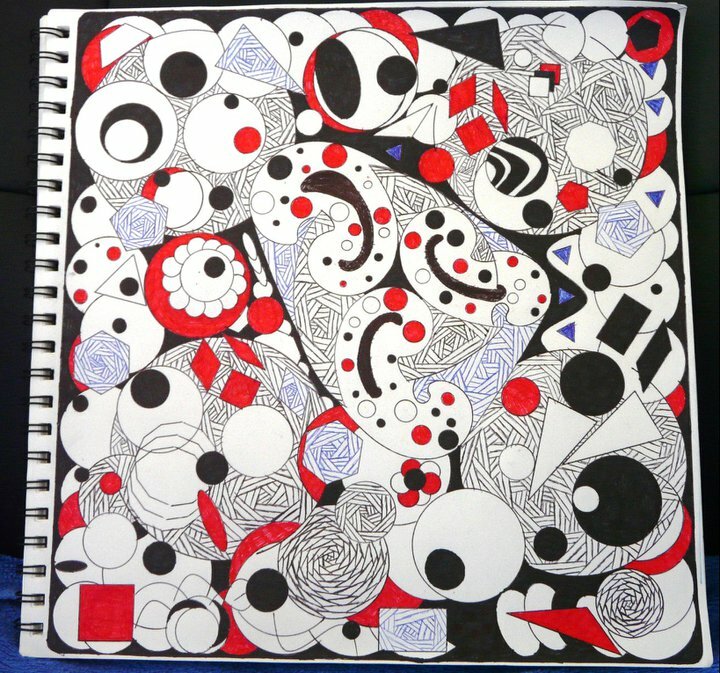 The above photo is a progress shot of an abstract drawing that I worked on for a couple of days during January 2014. I like it. I like this one a lot. This is an image of the finished abstract drawing with purple and blue hue oil pastels rubbed into the acid-free paper. I had so much fun rubbing the oils into the paper and seeing them mingle and create such an awesome effect. 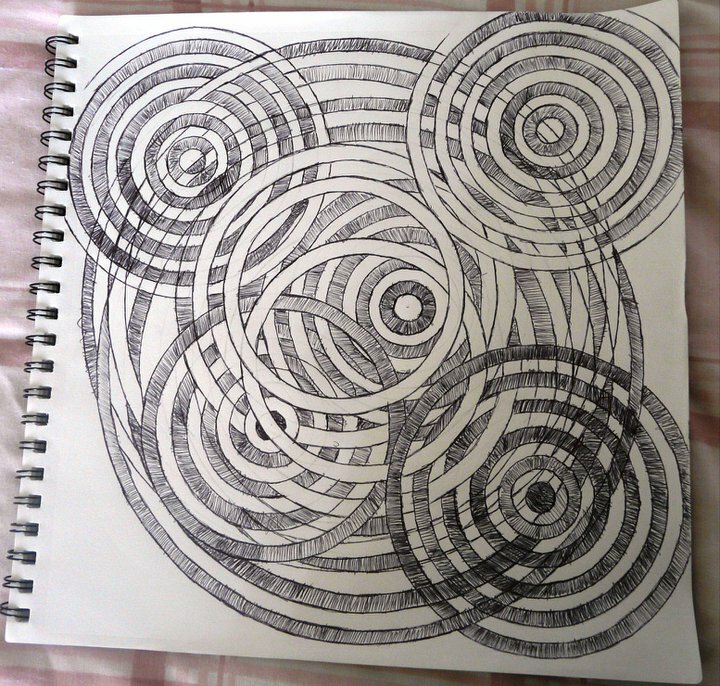 I never plan these kinds of drawings… they are organic and evolutionary. They decide what they want to be when they are on the page. My right brain has a fabulous time creating these images and I am so happy with the way this one has turned out. After some reflection, I have decided to dedicate this post to the complexity that I felt inside while playing with this drawing and especially to some of the complex personal/professional connections I have in my life. Life can be filled with twists and turns, ups and downs. Some days, I feel high with happiness (figuratively speaking people – I don’t do drugs), and other days I feel low and lost in a mire of depression. Although, to look at me, you probably wouldn’t see the dark depression that sometimes lurks in the shadows. It is difficult to express the complex emotions that go through me at various moments in my life. Sometimes I feel like I am truly on track in life, doing what I do best and loving things. Then, wham! Just like that, I am thrown into a darkness that has me wondering if I have anything to offer the world at all! Is that a bad thing to admit? I don’t think it matters really. I would rather be up front about the way I feel than hide in plain sight. Today, at work, I felt rather unhappy. I am going to be honest about how complex things can be for me. There are days, at work, where I interact with various people and have life learning experiences. I believe that every experience has something to offer me and I do what I can to learn from all experiences and better myself. 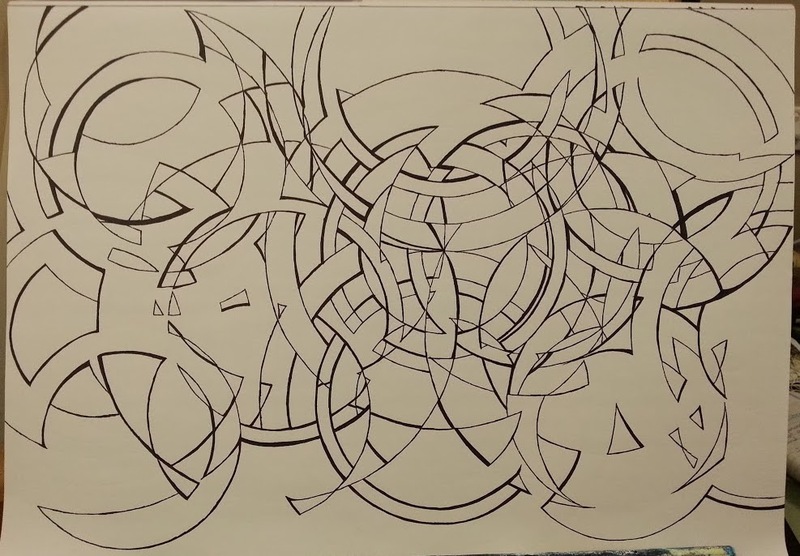 Anyway, I have noticed a pattern, a bit like my complex abstract artwork, and that is that some people seem to have an inability to stop themselves from over explaining, talking too much and dismissing other people’s opinions. Personally, there are times when I feel that I am not heard or listened to at all. I sit and reflect on what is happening and wonder, am I being over-sensitive? But mostly, I wonder how I can possibly be of any assistance to people around me if they cannot hear what I have to offer? This disinterest in my value makes me feel resentful, angry and desperate for freedom. I secretly (or not so secretly now…) wish for something better. Maybe a better job, maybe to run away and join the circus. I only wish I was good with heights and flexible enough to do that kind of job… alas, I fall short of those particular skill strengths. I hope you do not mind me confiding in you that I want to create better life for myself and to establish more balanced working relationships? I guess it’s a work in progress, relating to people. Yet, there are times when I find myself unable to make my way across that bridge as I encounter certain people who seem to consider that their opinion, thoughts and assessments of a given situation are always right. There are days when I wonder if these people only like to hear the sound of their own voice? It’s very difficult to stay tuned in to people who do this. Especially when they appear to be open to feedback only to somehow misplace that feedback and continue the same self-absorbed destructive behaviour pattern. I hear them waffle on and on, making superfluous points which are important only to them and their internal agendas. What can I say… life is complex. People are complex. I am complex. I guess it takes all sorts of people to make up the tapestry of humanity. Some people I like and can listen to for, like ever! I have to admit, I’m kind of over trying to look interested in people who do this. Harsh but true. At least I am honest. I had better leave my complex complaining there. I hope you are having a great day/night and getting the best out of life. I am sure that this situation is teaching me something valuable, even if it is not to treat other people the way that I have been treated by the ‘white noise’ brigade. Drawing in my new A3 Visual Diary. I’ve been sick this week, which means that I have been in bed either sleeping or resting on the couch. As a nice bonus, I have had some time to draw and look what I discovered on the page! Believe it or not, this image was inspired by a clasp from a beaded bracelet that I made a week ago. 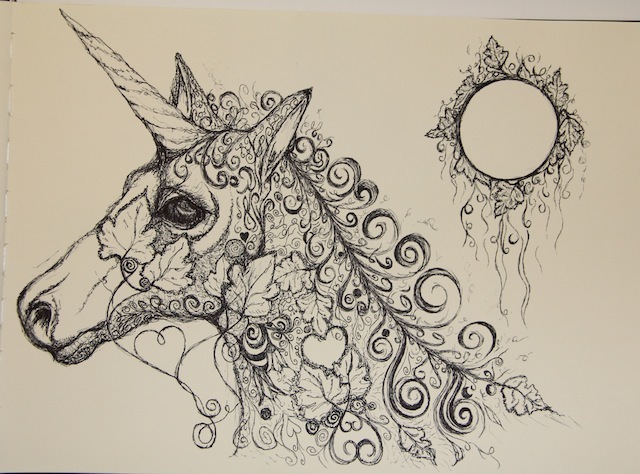 I love black ink pens and this drawing just came to life. But my creativity didn’t stop there. I am not sure what to title this one, but I was watching Supernatural as I was doodling around in my A3 diary and this is what came out. I think it is very symbolic of new life, opportunity and the creative life force that is inside all of us at all times. I think it shows a protective quality in the thorns as they safe guard the nurturing internal creative process in the middle. Again… I am not sure if this one is truly finished, but I am sure that will be revealed when the time is right. I have to say… this was a crap drawing at first and I really did not like it. I was so disappointed in the beginning but then, out of no-where it transformed into what you can now see. And that is why I love art. It is a process which is very symbolic of my life and the way that I process events inside myself. I let things be messy and messed up. I wonder how I will ever make it through the moment and then somehow things just work out. I love that. I truly do love that. I got myself this awesome A3 visual diary on Monday this week and decided that I would dedicate it to my very own Wonderland. 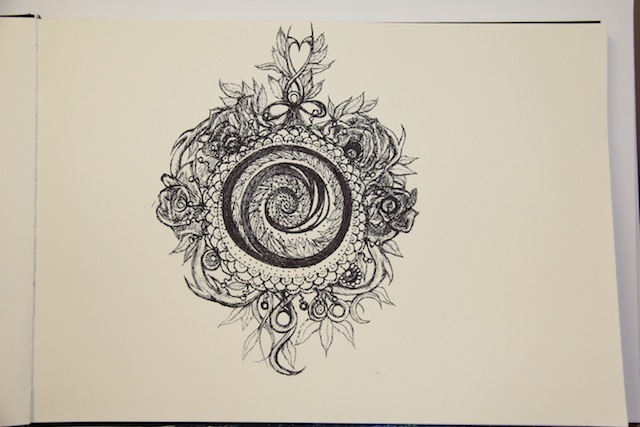 This image is the beginning page and the start of creative wonderland manifestations. I started this drawing with a mushroom in the center of the page and it grew into what you can see now. I have been playing with this image for three days now and I am loving where it is going. Have I mentioned how much I LOVE art? Today, I want to show you some of my visual diary playful creations. This is where you will begin to see some themes appearing in my artwork. Back when I lived in Melbourne, I did a general drawing class as part of my art course and found that I had developed an absolute LOVE of lines. This quickly developed into a love of geometric shapes over the years between 2004 and 2013. This top image seems to be one that a lot of people really like. Personally, I am not sure why? The reason is… to me it is a flop. I turned out okay-ish but it wasn’t what I had wanted to create when I put pen to paper. But I guess that is what happens with art. Sometimes you just make what you make and it is in the eyes of the viewer as to what they think is great. I guess that sums up where I was at when I did this piece. This image below has never been titled as I wouldn’t know where to begin. All I can remember about the time that I was creating this piece was that I had just come through a relationship break up and finding myself again as a single woman. I quite like the complexity in this piece. Actually, all of the drawings below were completed around the time that I was re-connecting with myself as a single and empowered woman. It was an intense but deeply healing experience to draw these images. They took days to complete but oh so worth the effort. Another untitled image – no idea what I was thinking while drawing it. I was just… ‘being’. And below is one of my fav pieces because of the simplicity in it. I remember staring with a figure 8 and expanding outward. All of my drawings here have morphed out of a single mark on the paper to become what you see now. I rarely sit down to actually design them, they create themselves without my left-brain-ness dictating where things will go. I think that is what I really truly love about lines and geometry — they are whatever they want to become. 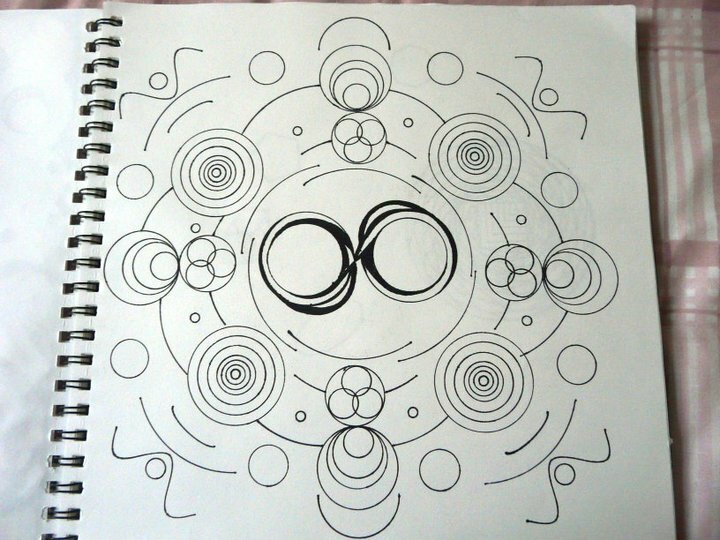 The possibilities for creation are infinite to me. Please comment on or share this post – thanks.